Can Safflower Equal the Benefits of Olive Oil? Oleochemicals, such as fatty acids, will be a vital link in the supply chain as their outstanding functionality and versatility make them ideal to be used in a multitude of applications. In addition, the high reactivity of this acid enables the production of a range of derivatives that can be tailored to meet the needs of a number of end-user industries, which use the formulations to produce the ideal blend of functionality and performance, reports BCC Research. Recently, a team of scientists successfully developed and tested three new varieties of safflower cultivars with an oleic content of up to 75 percent, which is similar to the level of oleic content found in olive oil. The varieties are also non-genetically modified. Developed at the Hyderbad-based Indian Institute of Oilseeds Research (IIOR), the new varieties of safflower can yield oil with beneficial properties comparable to olive oil, as well. Standard varieties of safflower contain between 16-20% oleic content, an amount that because of its higher oxidative stability, renders them less suitable for deeper and longer frying of food. Because of its higher single point saturation, these cultivars have applications in biofuels, cosmetics and detergents, reports the Olive Oil Times. The scientists developed the cultivars using a cost-eﬀective, environment-friendly classical breeding approach that crossed a low- and high-oleic genotype of safflower, producing the three non-genetically modified high-oleic lines of safflowers. “As safflower oilseeds command a lower price in the market, farmers have of late been cultivating other competing crops, such as gram,” Vrijendra Singh, a safflower breeder with the Nimbkar Agricultural Research Institute in Maharashtra tells the Hindu Business Line. According to Singh, the new safflower varieties with higher oleic content allow farmers to get a better price for the cultivars and also increase the acreage under this oil crop. The IIOR scientists tested the new varieties at 10 different locations across India under dry and irrigated conditions. 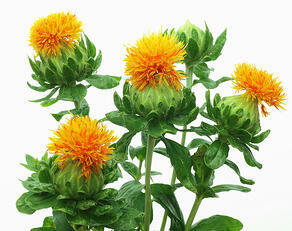 The varieties are first ﬁrst oleic saﬄower cultivars developed for growth under Indian conditions. The study reports that the oleic content of the safflowers, along with its content and seed yield, can be improved by classical breeding, according to the Olive Oil Times. Marico Limited, an Indian consumer goods company, funded the research behind the development. The company, which has licensed two of the high-oleic safflower lines, has begun commercial production of the safflower strains. India is the world’s second-largest safflower growing country. In its new report, BCC Research estimates the global market for natural fatty acids should reach $16.2 billion by 2021 from $12.4 billion in 2016, demonstrating a compound annual growth rate (CAGR) of 5.6%, from 2016 to 2021. Study findings will be published in Industrial Crops and Products in September 2017.